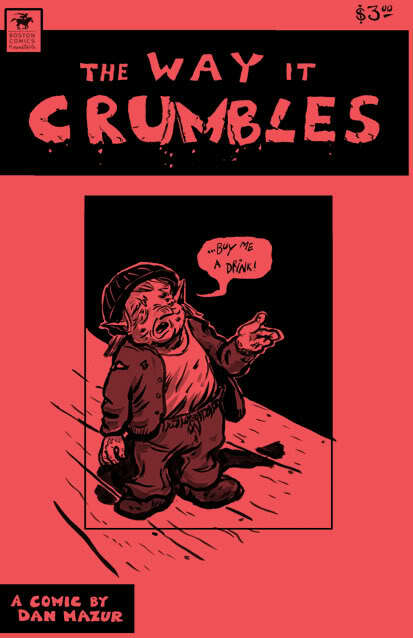 "The Way it Crumbles by Dan Mazur"
Mazur’s art has a complex, lived-in look that he achieves by varying the line weight. Sometimes he uses light crosshatching to achieve the desired texture, other times we see thick syrupy inks to provide the right mood. Looking at the way he stages shots and frames panels, it’s easy to see Mazur’s cinematic experience shine through. He also has a natural ear for dialogue that’s probably been aided by script writing. It’s complete with the small pauses, stammers, and stutters which mar real speech patterns and have been hallmarks of guys like David Mamet or Aaron Sorkin for years.